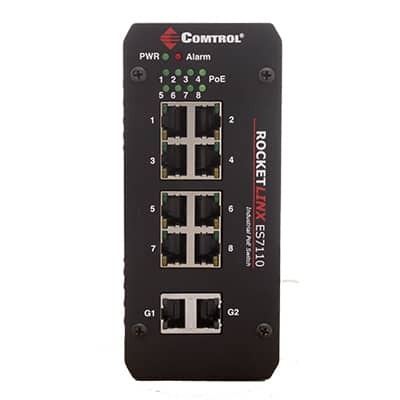 The RocketLinx ES7110 is an IEEE 802.3af compliant PoE switch designed for connecting a wide range of industrial PoE equipment such as IP surveillance cameras, wireless access points, VoIP phone sets, point-of-sale systems, and other devices where a power source is not conveniently located. 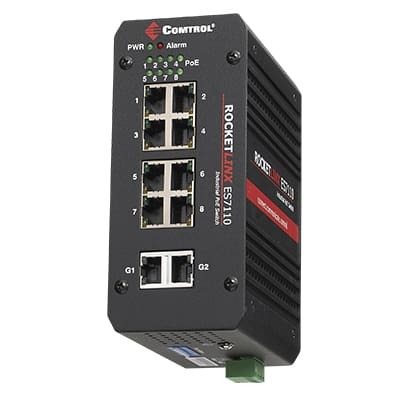 The RocketLinx ES7110 is equipped with eight 10/100BASETX PoE injector switch ports, with each port delivering power up to 15.4W, and two 10/100/1000BASE-TX (Gigabit) Ethernet uplink ports for transferring data to the network. The ES7110 supports QoS, which ensures high quality video traffic transmission by adjusting the data transfer priority. The ES7110 features convenient wiring with a standard 4-pin industrial terminal block for power input and a fault relay alarm contact output. Additionally, each Ethernet port has a Port Link Alarm, which can be configured to automatically trigger on connection issues, warning administrators of abnormal operating conditions and ensuring quick resolution to network issues. 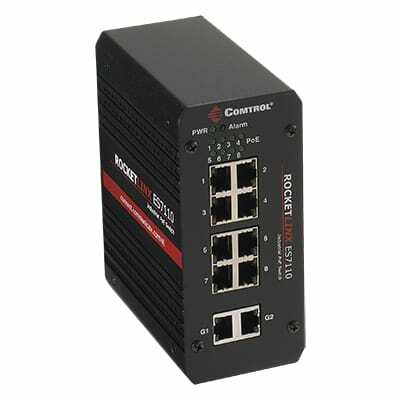 In addition to advanced PoE and networking capabilities, the ES7110 is designed for industrial applications and deployment in harsh conditions. With an IP30 rigid aluminum housing and extended operating temperature range, consistent operation is ensured in environments such as mass transit vehicles, factories, and outdoor settings.